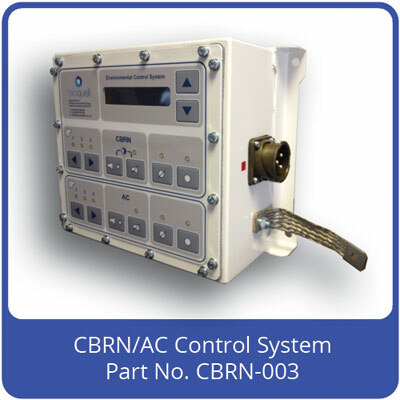 What is the CBRN Control Panel ? It is common for military vehicles, to be equipped with CBRN (Chemical, Biological, Radiological and Nuclear) defence systems. Such systems use special filters in conjunction with fans to supply and clean air from the outside to keep internal personnel safe from exposure to airborne threats. The CBRN system comprises two main components: the Fan/filter pack and the control panel. The control panel allows the vehicle crew to switch the system on/off and control the fan speed. It also display important parameters such as vehicle internal pressure and filter status. The control panel is made exclusively for Bioquell Ltd in the UK. It is installed typically inside military vehicles, where it is connected via a wiring loom to the fan/filter pack. Dual channel control panels also allow control of a vehicle air conditioning system. The control panel is connected to the vehicle's battery/alternator and supplies power out in a PWM (pulse width modulated) form. By altering the mark-space ratio of this signal, the DC fan motor in the CBRN fan/filter pack may be speed controlled to run at different duties. The panel also incorporates pressure sensors to allow it to display important parameters and warn with an alarm in the event of a system malfunction. The main advantage of the system is that it is digital and does not use resistors to speed control. This increases efficiency and reduces heat load on the vehicle. The system is also capable of providing high currents - up to 25 Amps for the CBRN fan motor. Despite generating a 16 KHZ square wave at these currents, sophisticated EMC filtration inside the panel ensures that it meets the requirements of Mil Std 461F.